Going Green DC chatted with Veneka Chagwedera from Nouri Bars to learn a little about what inspired this local startup, how Nouri bars are helping fight hunger around the world, and what kinds of environmentally friendly business practices Team Nouri employs at the office. 1. Tell us a little about how you got started with Nouri Bars. What was the inspiration behind the company? The inspiration for the bars straight from our kitchen. Jared and I were experimenting with raw food and healthy ways to make great tasting snacks to carry with us on hikes. We created the bars and found they were not only healthy but delicious and super satisfying. In fact, the Creamy Cashew bar we sell is still based on that original recipe! It’s a common belief that the best tasting food isn’t healthy for us, and that healthy food doesn’t taste good. Nouri solves this problem by bringing you a delicious snack bar that is both nourishing and delicious – no added chemicals or preservatives. Just good, wholesome, farm-grown ingredients like nuts, dates, cinnamon, cacao and love. The inspiration for the social mission comes from our own stories. I grew up in Zimbabwe and witnessed the poverty and education challenges of children in developing countries. As two recent college graduates, we felt that we could make a difference. Nouri’s social mission enables us to become changemakers — empowering children around the world to pursue education and escape the cycle of poverty. 2. What kind of impact has your program had so far on helping to feed the hungry? 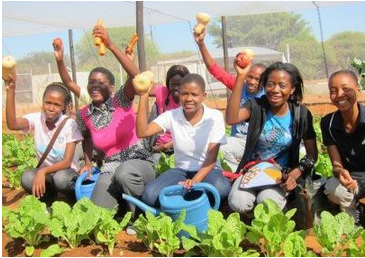 We work with Stepping Stones International (SSI) located in Gaborone, Botswana. We have helped to provide over 15,000 meals thus far. By the end of 2014, we plan to expand our school feeding program to reach children in Guatemala, Haiti, India and the US. 3. Do you only work abroad or are you involved in helping to feed hungry children in the U.S? Hunger and malnourishment is not just a foreign issue, and it happens all too often in our own backyard. We are working to expand our partnerships to schools here in the U.S. We plan to roll out our domestic U.S. partnerships by early 2014, but in the meantime our team members have been having an impact in their local communities by serving in local food pantry’s and soup kitchens. Our bars aren’t the only thing about Nouri that’s helping feed the hungry; our team members are too. And that’s something we’re proud of. 4. What flavors do you offer, which are your favorite and which are most popular? We have three delicious flavors: Creamy Chocolate Cashew, Cinnamon Apple Spice and Peanut Butter and Cherry. My favorite is the creamy cashew. Jared’s favorite is the peanut butter and wild cherry, because it reminds him of his childhood favorite of PB&J, but with a twist. Our most popular bar is definitely the creamy cashew tied with the peanut butter and wild cherry. 5. Can you tell me a little about what’s in the bars and their nutritional information? Are any ingredients sourced locally? The bars are made from simple and wholesome ingredients such as organic fruit, chocolate, nuts, and seeds, and all the ingredients are sourced from farmers in the U.S.
6. Would you consider Nouri a sustainable business? Absolutely! We firmly believe in the Kaizen philosophy which states that little changes and improvement over time lead to a much stronger and sustainable change which is what we are trying to do with Nouri. We are trying to fundamentally change the way that people interact with their food by changing their perceptions on what healthy food can taste like as well as how their food purchases may affect others. It is this philosophy which is ingrained into each bar such that it is driven by sales rather than an afterthought. 7. What kinds of environmentally friendly business practices to do you employ? We are big fans of recycling and run an almost paper-less office. We work with stores to send our invoices and materials electronically. We also work with suppliers who use environmentally friendly wrappers and packages for our products. 8. How can schools get involved with your program? Teaching children about the issue of hunger in developing countries is an excellent way to raise their global awareness and also helps them appreciate the everyday things they enjoy – like food! Get involved in selling Nouri bars in school cafeterias and use the funds raised by the school to give to another school in a developing community. Schools can let us know if they would like us to come and give a talk or spend a day with their students. We love working with children and are happy to make the trips to their area to help raise awareness about the importance of community service and giving back. 9. How can individuals help or get involved in helping to feed the hungry? Our short term goals are to bring delicious bars to communities around the U.S. We are always looking for new stores, coffee shops, offices, and yoga studios to carry our bars. However, it is important to note that hunger is not just an international issue, but happens in our own country as well. It is important for individuals to work within their communities to help those who are less fortunate; volunteer at a homeless shelter, donate cans of food to a food bank or just spend a little bit of your time helping out at your local soup kitchen. Little improvements make a big difference. 10. Is there anything else you would like to add? Please feel free to share additional information or details about the company and your mission. Looking back after five years we hope to have provided meals in school, and by extension an education, to over 10 million of the poorest children worldwide. There is no telling how far these millions of kids will change through the power of overcoming hunger and gaining an education. Through Nouri, we hope to leave a legacy that will be a social movement among a generation and fundamentally transform how we interact with our food purchases as well as our concept of good tasting healthy food.